Product information "100 Years Bulgarian Telecommunications. Quality - BU"
The obverse depicted Bulgaria coat of arms. Below is the year of issue – 1979 and an inscription “Leva”. In the outer circle of the coin has an inscription “Peoples Republic of Bulgaria” and the nominal value of 5 leva. The reverse side depicted a radio antenna. Below is the logo of Bulgarian Posts. In the outer circle of the coin has an inscription “One hundred years Bulgarian telecommunications” and the years “1879 – 1979”. 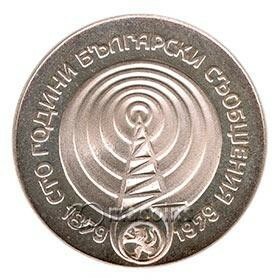 Related links to "100 Years Bulgarian Telecommunications. Quality - BU"